If this review seems a bit short, it's because the bus itself is. However, in this case, that's not a bad thing. The 31 is a great time saver if one needs to get from Mattapan to Forest Hills. It starts out on Blue Hill Avenue with the 28 and 29, but it quickly turns off onto Morton Street to Forest Hills. 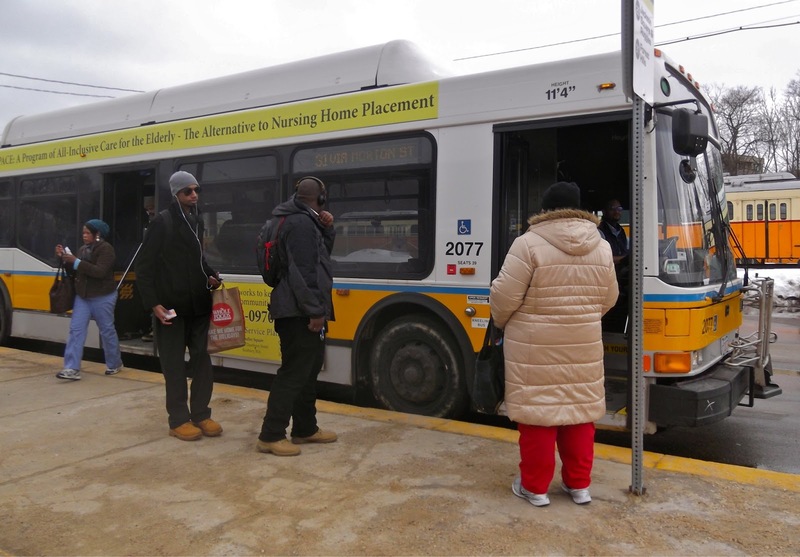 Like the 28, the 31 has many more people getting on at Mattapan Square than at the station. After that, the stops on Blue Hill Ave are relatively minor, with only one or two people (if any) getting on at each stop. Once it gets onto Morton Street, the stops get much farther apart and the bus goes through southern Franklin Park. At this point, the bus travels very fast, not picking anyone up or dropping anyone off. It goes right by the Shattuck Hospital (though the route's a good resource for people who need to get there), and pulls into Forest Hills Station. This is a faster way to get between Mattapan and Forest Hills than the 30. It's only a five minute difference (or so the MBTA schedule says) but the 31 runs much more frequently than the 30. So frequently, in fact, that you can pretty much forgo consulting the schedule and still not have to wait that long. The trip is scheduled to take about 12 minutes, but it probably took me 10. It's also way faster than the train; with the train, you have to take the Mattapan High Speed Line to Ashmont, wait for a Red Line train, take it up to Downtown Crossing, wait for an Orange Line train, and take it back down to Forest Hills. If you need to get from Mattapan to JP, this is your bus. You can tell from the snow in the background that I did not take this bus recently. Ridership: This is a route that people take from start to finish. Pretty much everyone on the bus was using it as a link from Mattapan to Forest Hills (though some people probably use the Shattuck Hospital connection, too). The bus was half-full on a Sunday - not bad. Pros: Two words: time saver. This is such a fast, easy way to get from Mattapan to Forest Hills and JP. Its headways are absolutely amazing for a non-Key Bus Route: Every 5 (!) minutes rush hour, every 10 minutes midday, every 13 minutes on Saturdays, and every 18 minutes on Sundays. That's better than the 116 and 117, and those are both Key Bus Routes! Nearby and Noteworthy: The place that comes to mind is the Shattuck Hospital. The 31, along with the 21 from Ashmont, provides very frequent service here. I wish I knew someplace good this bus goes that's not a hospital... but I don't. Well, viewers, this seems like a good time to review my rating criteria. A 10 means a bus that is perfect (however, that perfection is relative; we all know public transportation will never be perfect). The only con I gave this bus was that it's such a great route that it should have more recognition, and that's not even a real con. So with that, I present to you and excellent time-saver and the first 10 on this blog: the 31 [smatterings of applause]! Latest MBTA News: April 13-14, the Red Line will run shuttle buses between Harvard and Alewife. And don't forget that the Blue Line is running shuttle buses from Airport to Wonderland this weekend. Finally, if you haven't noticed, I've added lists of bus routes and train stations on the blog. You can find them by clicking on the tabs that say "Bus Routes" or "Train Stations" on the top of the blog page. Or you can just click on the links provided. What do you think about the MBTA fight between the governor and the Legislature? Thanks for the idea! You inspired me to write a post about that very subject. As for my thoughts, I like Patrick's plan, but the impacts on our daily life might be a lot. I wouldn't want to pay tolls on I-93, for example. If you take another trip on the 31 (or 28/29) definitely stop by Simco's! Located on Blue Hill Avenue, right next to the bridge over the Fairmount Line, they have been serving the best hot dogs to be had in city limits since 1935. I have been going there 20+ years. And the legends are true: the hot dogs really are a foot long! Thanks! That sounds pretty noteworthy (and who doesn't like foot-long hot dogs? )!